From being a historic city with stories of Mughal emperors, British and Maratha rule and India’s freedom struggle, to transforming into an urban metropolis, a textile and a world-class education hub, Ahmedabad has established itself on all fronts. This 606-year old Walled City has recently been registered as UNESCO World Heritage Site, thus becoming India’s first-ever world heritage city. Here we bring you some more reasons to why you should visit Ahmedabad. 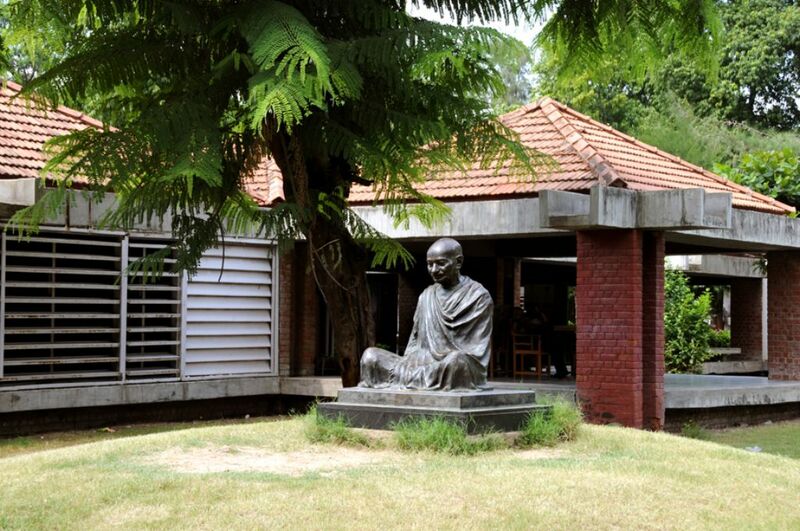 Ahmedabad is the place where the ‘Father of the Nation’, Mahatma Gandhi started India’s freedom struggle. Mahatma Gandhi’s home was Sabarmati Ashram, nestled on the banks of Sabarmati River and it was here that he led and managed the course of the Indian Independence movement for a long time. This place holds a great importance in the history of India, and many visitors come here to catch a glimpse into the life and times of Gandhi. The Ashram houses a library and a museum that depicts the story of Mahatma Gandhi, his struggles and revolutionary movements. The entry is free. For a break from the humdrum of the city life, natives of Ahmedabad make their way to the beautiful polygon-shaped Kankaria lake. In the heart of the lake lies Nagina Wadi, a garden-themed restaurant. There are also several food stalls, an illuminated musical fountain, kankaria zoo, a toy train, tethered balloon rides, a children’s park and a myriad of water sports, for instance, jet skiing, zorbing, speed boat, etc – all available. Whether you’re looking for some action or peace and quiet, this place has something to offer. Ahmedabad is incomplete without festivals. In fact, the festivals are the heartbeat of this beautiful city – from Navratri celebration, which is almost a nine day affair and involves music, garba dancing and most importantly Durga Pooja, to International Kite festival, also called Uttarayan, where the skyline is embellished with colorful kites soaring in the sky. An unmissable festival is the annual Rath Yatra of Lord Jagannath held at the Jagannath Temple and involves procession that is led by the decorated chariots. 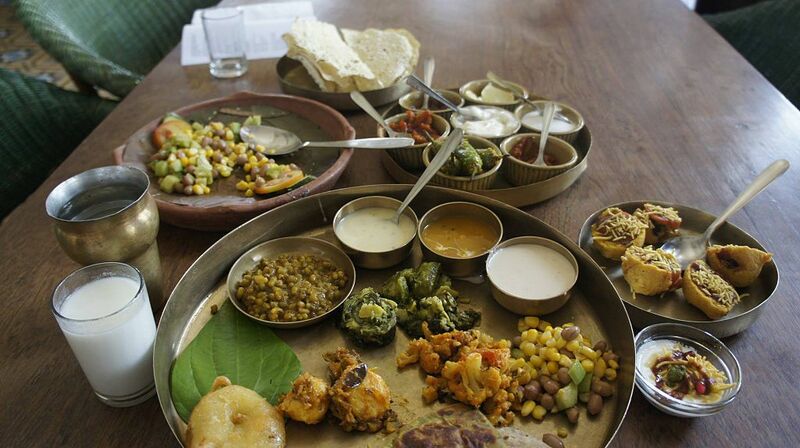 The natives of Ahmedabad are avid food lovers and boast of lip-smacking snacks and street food that are hard to refuse. Khakhra, namkeen, fafda, soft and spongy khaman Dhokla, maska-bun, fritters with green chillies and chutney, among other things. Each of these sumptuous food items will leave you craving for more. Midnight hunger pangs? Then make your way straight to Manek Chowk, a haven for enjoying the traditional gastronomy of Ahmedabad. Manek Chowk, Ahmedabad, Gujarat, India. The Ahmedabad shopping scene is thriving and the city is world-famous for its textiles. There is a myriad of street shops dotting the Manek Chowk that sell colourful Ahmedabadi textiles, including Gujarati outfits and handicrafts. Law Garden Market, Lal Darwaza and CG Road are some other street shopping places where you can find knick-knacks and souvenirs to take back home. Apart from street shopping, Ahmedabad even a range of malls to choose from, for instance, Iscon Mega Mall and Gulmohar Park Mall, sell everything to satisfy the shopaholic in you. Law Garden, Netaji Road, Ellisbridge, Ahmedabad, Gujarat. History, art and culture lovers should set their sights on the museums and art galleries in Ahmedabad as they portray the city’s rich and amazing past. The must-visit museum in Ahmedabad is the Calico Museum of Textiles, which is one of its kind in India and depicts the rich textile history through a vast collection of antique textiles unique to India. To explore the artsy side of the city, Shreyas Folk Art Museum depicts the regional art and culture. For a peek into the history, architecture, art and culture of Ahmedabad, Sanskar Kendra is the place to be. It features artefacts and a vast collection of photographs that offer a glimpse of the city’s glorious past. If you’re fan of vintage cars, Auto World Vintage Car Museum is the spot for you. It is one of the largest and biggest automobile museums in India that features high-end vintage cars, carriages and other vehicles. Ahmedabad is home to a plethora of temples and mosques that not only depict the city’s history, but also are architectural gems. Once a main center of Sufism, the city has some of the oldest mosques dating back centuries. Some of the prominent ones are Jama Masjid built in 1424 by Sultan Ahmed Shah I, and Sidi Saiyyed Mosque built in the 16th century. Jama Masjid, Manek Chowk, Gandhi Road, Ahmedabad, Gujarat. Sidi Saiyyed Mosque, Salapose Road, Opposite Electricity House, Lal Darwaja, Ahmedabad, Gujarat. Some of the temples that are of immense historical and architectural relevance include, Shree Swaminarayan Temple dating back to the 19th century and is the foremost temple of the Swaminarayan sect. This temple is known for its intricate carvings and stunning architecture. Another worth checking out temple is ISKCON temple dedicated to Krishna and Radha. Ahmedabad is the city where Hindu and Muslim communities co-exist harmoniously and this is reflected in its Indo-Islamic architecture spread across the city. Some of the architectural marvels include Teen Darwaza, which is one of the longest historical gateways in the city with beautiful arched gates, intricate carvings and semi-circular shaped windows embellished with jaali work. In Old Ahmedabad, you’ll find restored heritage houses. Another architectural marvel are the Shaking Minarets, also known as Jhulta Minara, which are three stories high, complete with carved stone balconies. If one of the minarets shakes, the other one also vibrates automatically after a gap of a few seconds. Teen Darwaza, Bhadra, Ahmedabad, Gujarat. Shaking Minarets, Nr. Kalupur Railway Station Road, Sakar Bazzar, Kalupur, Ahmedabad, Gujarat. Given the city’s majestic past, it comes as no surprise that it is home to many historic structures. The Bhadra Fort, a royal fort with a magnificent palace, a Bhadra Kali temple and a the lush courtyard of the Sarkhej Roza, a mosque and a tomb nestled in the Makaraba area of the city and possessing Islamic style architecture from the Mughal era. The history of the city is palpable at every corner. Bhadra Fort, Court Rd, Bhadra, Ahmedabad, Gujarat. Sarkhej Roza, Makarba Rd, Makarba, Ahmedabad, Gujarat. And it’s safe and friendly! The locals are amiable, warm and welcoming. The phrase “Atithi Devo Bhava” (meaning ‘The Guest is God’) befits this place – and this quality alone is a bonus for tourists travelling to the city. Ahmedabad is one of the safest places in India. You can walk around comfortably at night and solo travellers can experience the beauty of the city, without fretting about safety.